This article is about the online mode in Brawl, Smash 4, and Ultimate. For information about the spectators during a match, see Crowd. Betting in the Spectator mode in Brawl. Spectator Mode is an online mode in Super Smash Bros. Brawl, Super Smash Bros. 4, and Super Smash Bros. Ultimate, allowing players to remotely view recent replays of online battles between other players and bet Gold on their outcomes (except in "Ultimate"). The matches to be viewed are selected at random from recently played matches in the public online modes (With Anyone in Brawl, For Fun and For Glory in Smash 4, and Quickplay in Ultimate). In addition to recent replay viewing in the Spectate menu, Ultimate also features live match spectating in Battle Arenas. Spectator Mode was available within the With Anyone sub-menu. When viewing a match, only the characters used and stage was shown, with the names being omitted. Assuming the player has no information about the match and so bets at random, the spectator will statistically lose coins in the long run. For very small bets however, the value is rounded up, giving a neutral payout overall. Small sticker bundle, consisting of 10 stickers. Medium sticker bundle, consisting of 20 stickers. Large sticker bundle, consisting of around 45 stickers. A CD, provided there were still random songs left to unlock. Doubled winnings from the bet. Tripled winnings from the bet, with a maximum of 999 coins. As betting is done at a loss in the long run, betters would have had to apply matchup knowledge to their betting strategies and take advantage of bonus chances in order to gain coins in the long run. Spectator Mode returns in Super Smash Bros. 4. 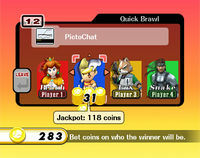 The Nintendo Network ID of the players is displayed, alongside the character used, and their win percentage. A multiplier between 2 and 10 is calculated (displayed rounded to 1 decimal point) based on this win percentage (or a combination of two in Team Battles). The multiplier is lower for those with higher win percentages and higher for those with lower win percentages. Prior to the match starting, spectators may optionally bet up to 100 coins (shortened to "G") on possible winning players or teams. Should the chosen player win the bet, they will receive the Jackpot, which is their wager multiplied by the winning combatant's multiplier. Afterwards, the player is given the option to go for a "Winning Streak" - betting with winnings from the previous game instead. This obviously results in a much larger potential for payouts. However, after the third consecutive win, the winnings are automatically paid out (which may result in the unlikely, but achievable 100,000G theoretical cap). In four-player matches, should the chosen character come second, called a "Near-Win," then the spectator will be rewarded with an automatic and much smaller "Nice!" payout. Bonus Chances also return, awarding extra gold, trophies, and other rewards, though only in the case of a "Jackpot" outcome. As a result of new bet multipliers and "Near-Win" payouts, betting is much more profitable in SSB4 compared to Brawl, due to an almost guaranteed long-term payout, assuming a good betting strategy is used. Spectator Mode returns in Super Smash Bros. Ultimate. However, players can no longer bet coins on players or teams. In the NTSC version of Brawl, if a match was a free-for-all, the top-right corner would incorrectly read "Quick Brawl", as opposed to the correct term, "Basic Brawl". This error was later fixed for the PAL regions. Spectator Mode on the PAL version of the game. A Bonus Chance match announcement. A winning bet with the "small sticker bundle" bonus. Follow-up to the previous image. The stickers won can be seen scrolling through the bottom of the screen. This page was last edited on March 18, 2019, at 17:03.